Spectracide Weed Stop For Lawns Plus Crabgrass Preventer Granules can be applied anytime spring thru fall when weeds are actively growing. The product will kill over 200 lawn weeds commonly found in home lawns, including dandelion, chickweed, thistle and clover, and will prevent crabgrass and other undesirable annual grasses. This product has up to 5 months control. Won't harm lawns when used as directed. 12.8 lb 2,4-dichlorophenoxyacetic acid equivalent per ton. 2.8 lb (+)-(R)-2-(2 methyl-4-chlorophenoxy)propionic acid equivalent per ton. 1.2 lb 3,6-dichloro-o-anisic acid equivalent per ton. 3.2 lb dithiopyr per ton. In New York State: Do not exceed one application at the rate of 3.6 lb of product per 1,000 sq ft (0.25 lb active ingredient of dithiopyr per acre). Do not apply this product in a way that will contact any person or pet, either directly or through drift. Keep people and pets out of the area during application. Do not allow people or pets to enter the treated area until dusts have settled. Read all precautions and directions for use carefully before applying this product. If incorporation is accomplished by watering-in, do not enter or allow entry to the treated areas (except those involved in watering) until the watering-in is complete and the surface is dry. Do not use Spectracide® Weed Stop® For Lawns Plus Crabgrass Preventer Granules on colonial bentgrass, dichondra, carpetgrass, or ‘Floratam’ St. Augustinegrass. Do not use this product where desirable clovers are present or spread (apply) the granules onto flowers, vegetables or ornamental shrubbery. Do not spread over exposed roots of trees and ornamentals. Do not exceed specified dosage for any area. Do not use clippings from treated areas for mulching vegetables or fruit trees. Do not contaminate domestic or irrigation waters. Do not use this product on or near desirable plants, including within the drip line of the roots of desirable trees and shrubs, since injury may result. Do not apply directly to or near water, storm drains, gutters, sewers, or drainage ditches. Do not apply within 25 feet of rivers, fish ponds, lakes, streams, reservoirs, marshes, estuaries, bays, and oceans. Do not apply when windy. Apply this product directly to your lawn, and sweep any product landing on the driveway, sidewalk, gutter, or street back onto the treated area. To prevent product runoff, do not over water the treated area(s) to the point of runoff or apply when raining or when rain is expected that day. If the lawn has been seeded recently, wait until after the third mowing before using this product. Do not seed, overseed or sprig the treated area for 10 weeks after application. Spectracide Weed Stop For Lawns Plus Crabgrass Preventer Granules will control all your lawn’s weeds in one application. Spectracide Weed Stop For Lawns Plus Crabgrass Preventer Granules will kill over 200 lawn weeds commonly found in home lawns including dandelion, chickweed, thistle and clover, and will prevent crabgrass and other undesirable annual grasses. Established Cool Season Turfgrasses – Kentucky bluegrass, perennial ryegrass, fine and tall fescues. Established Warm Season Turfgrasses – Bahiagrass, bermudagrass, buffalograss, centipedegrass, zoysiagrass, St. Augustinegrass (except ‘Floratam’). Use of Spectracide Weed Stop For Lawns Plus Crabgrass Preventer Granules on lawns and ornamental turfgrasses that are not well established, or have been weakened by stress due to mechanical operations, pests, excessive temperatures, or lack of moisture may increase the chances for turfgrass injury. Allow turfgrass weakened by these stresses to recover before application of this product. 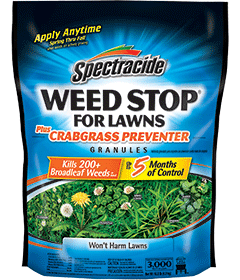 Spectracide Weed Stop For Lawns Plus Crabgrass Preventer Granules can be used either in the spring or fall. Spectracide Weed Stop For Lawns Plus Crabgrass Preventer Granules should be used when the grass and weeds are actively growing and the soil is moist. Do not apply under drought conditions. In the spring, the ideal time to apply Spectracide Weed Stop For Lawns Plus Crabgrass Preventer Granules is just before or when the forsythia is in bloom or when the first dandelion flowers appear. In southern areas (see map), make a second application of Spectracide Weed Stop For Lawns Plus Crabgrass Preventer Granules in six to eight weeks for best weed and crabgrass control. In the fall, apply Spectracide Weed Stop For Lawns Plus Crabgrass Preventer Granules when the weather cools and both the grass and weeds are actively growing, generally around Labor Day. This product needs to stick to the leaves of broadleaf weeds and should be applied when the grass is wet from dew or rain; poor results will occur if it is applied to dry lawns. The lawn should not be watered or disturbed for 24 hours after application. Delay mowing for three days after application. Apply this product when the wind is calm. Do not apply this product onto desirable plants or shrubs as damage may result. If the product gets onto other plants, immediately brush or wash it off the foliage. Use a drop or rotary spreader designed to apply granular fertilizers. Avoid skips or excessive overlaps as poor weed control or turfgrass injury may result. Apply 3.6 pounds of product per 1,000 sq ft of turfgrass. In New York State: Do not exceed one application at the recommended rate of 3.6 lb of product per 1,000 sq ft (0.25 lb of dithiopyr per acre). Other States: Do not apply more than 3.6 pounds of product per 1,000 square feet of turfgrass per application. If necessary, a second application may be made no sooner than 30 days after the first. Do not apply more than 7.2 pounds of product per 1,000 square feet per year. For best results, apply this product evenly and uniformly, avoiding streaking, skips or overlaps. For 3.6 pounds of product per 1,000 square feet of turfgrass: Check your spreader on 275 square feet and adjust to apply at the rate of 1 pound of product per 275 square feet. Check equipment frequently to verify calibration. These spreader settings are approximate. The age and condition of spreader, speed of operation and evenness of terrain may require slightly different settings for desired coverage. *Spreader setting recommendations are accurate for the specified spreader and the products used under the test conditions (temperature and humidity). Results obtained by an applicator in the field may vary based on spreader calibration differences, speed and environmental factors (temperature and humidity). PESTICIDE STORAGE: Keep in original container in a cool, dry area, away from extreme heat and direct sunlight. Do not store near food, feed, seeds or other pesticides. CAUTION. Causes moderate eye irritation. Harmful if absorbed through skin or if swallowed. Avoid contact with skin, eyes or clothing. Handlers should wear long-sleeved shirt and long pants, shoes plus socks, and chemical-resistant gloves made of any waterproof material. Follow manufacturer's instructions for cleaning/maintaining PPE. If no such instructions for washables exist, use detergent and hot water. Keep and wash PPE separately from other laundry. Discard clothing and other absorbent material that have been drenched or heavily contaminated with the product's concentrate. Do not reuse them. Users should wash hands before eating, drinking, chewing gum, using tobacco, or using the toilet. Users should remove clothing/PPE immediately if pesticide gets inside. Then wash thoroughly and put on clean clothing. If pesticide gets on skin, wash immediately with soap and water. Have the product container or label with you when calling a poison control center or doctor or going for treatment. For additional information in case of emergency, call toll free 1-800-917-5438. This pesticide is toxic to fish and aquatic invertebrates and may adversely affect non-target plants. To protect the environment, do not allow pesticide to enter or run off into storm drains, drainage ditches, gutters or surface waters. Applying this product in calm weather when rain is not predicted for the next 24 hours will help to ensure that wind or rain does not blow or wash pesticide off the treatment area. Rinsing application equipment over the treated area will help avoid runoff to water bodies or drainage systems.